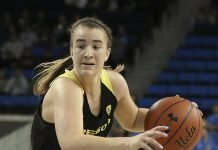 Mallory McGwire has been re-inserted into Oregon’s starting lineup since Lexi Bando’s injury. Photo courtesy of Oregon Athletics. When senior guard Lexi Bando was diagnosed with a left-leg stress fracture two weeks ago, No. 6 Oregon found themselves with a big problem: how would they fill her shoes? Bando has been the most reliable player in coach Kelly Graves’ four years with the Ducks, starting every game and averaging about 10 points an outing each season. This year she has shot 45 percent from the three-point line, leading the charge for a team that has become a dangerous outside scoring presence. But there is no timetable for Bando’s return, and though she practiced without a protective boot today, she is out for this weekend’s matchups against #24 Stanford and #25 Cal, and for the foreseeable future. Yet, if their first test is any indication, Oregon might be alright without her for the time being. 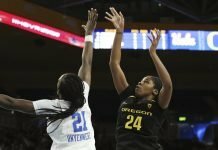 Through their first four games without Bando, the team seems to be grinding out a solution for her absence by changing their game plan, and in switching lineups. 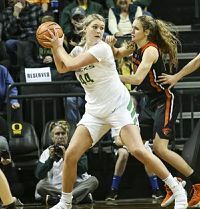 Sophomore post Mallory McGwire has returned to the starting lineup for the first time since mid-December, when she was replaced with freshman Satou Sabally, who cemented the Ducks’ shooting prowess. 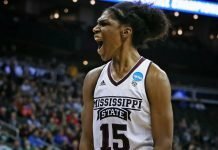 McGwire now shoots over 50 percent due to her own hard work, and she can be a threat from inside the arc or under the basket, with star forward Ruthy Hebard. In the four games that Bando has missed since her injury, Graves has started 6-5 McGwire, who has averaged seven points per game in that time. While Oregon can rely on McGwire’s 17-footers from the high post, they aren’t as valuable, point-wise, as Bando’s outside shot. As McGwire came off the bench, she has settled into a steady pick and roll into a solid mid-range jumper. Graves also said that with McGwire in the high post, it’s easier for the other team’s defense to put two defenders on Hebard in the low post, but the Oregon coach is confident his team can settle into a new rhythm as they await Bando’s return. “(The new approach) can be equally as effective, we just haven’t done it for a while, so we’ve gotta change how we approach things,” Graves said. But changing the offense so abruptly has not come without struggles. Oregon was unable to secure the away-win in their first game sans-Bando, losing 85-79 to Oregon State in overtime. Graves said the loss was not because of Bando’s absence, but that the Beavers simply played better, working harder on defense. Oregon State coach Scott Rueck said they didn’t adjust defensive strategy for the game after learning Bando would not be playing. “We were so locked in on that game plan, to change things on the fly, we just rolled with what we were going to do anyway,” he said. For the rematch two days later, the Beavers made some defensive changes, deciding to help down in the post without Bando as a threat on the perimeter. But, in a game where Hebard went 2 for 15 in the low post, this defensive adjustment hurt Oregon State. “We paid for that,” Rueck said. As the Ducks traveled to the mountains this past weekend to play Colorado and Utah, the team struggled before settling into the new offensive lineup. With 2:30 left in the first quarter against the Buffs, Oregon secured their first lead in the game, 15-14. They were not as slow to start against the Utes in their next matchup, leading by 19 with three minutes left in the first. They ended the quarter with an eight- point lead, 25-17. At Colorado, Oregon looked deeper down their bench, with junior forward Oti Gildon and senior guard Justine Hall getting more time on the court than they had seen in the games prior to Bando’s injury, with 17 minutes each. Oregon won 74-55. In Utah, Gildon played 27 minutes – as many as Hebard – and scored seven points to help her team secure their ninth conference win, 84-68. Star guard Sabrina Ionescu, with 19 points, 13 assists, and 10 rebounds, cinched her ninth career triple-double and fifth on the season, which is only one away from the NCAA single-season record. Lexi Bando joined her teammates at pre-game shootaround in Utah this past weekend. Photo by Matt Prehm. Bando, whom Graves has describes as the “glue” player that brings the Ducks together, traveled with the team on the Mountain trip and will continue to take road trips until she is cleared to play. Before the Utah game, she put up shots with her teammates while wearing her protective boot. The road doesn’t get any easier for the Ducks, as they host No. 25 California and No. 24 Stanford this weekend. And though they are managing for now, Graves is clear that he and his team are ready to return to their original game plan – with Bando – anytime. “We wish for a quick recovery because we need her, there’s no doubt,” Graves said.